Privacy International has published documents which reveals how the company - Nokia Siemens Networks (NSN) denies the sale of surveillance centers, but has simultaneously built in Pakistan cyber monitoring infrastructure - along with two old friends from the surveillance world, Trovicor and Utimaco . The aim of the cooperation that which was valid until 2011, was the establishment of a "Lawful Interception Management" system the company Utimaco for the largest Pakistani mobile operator MobiLink - said applying the adjective "lawful" is another matter. The system should forward monitoring data to a central monitoring center in Islamabad. The cooperation with Trovicor Team was entrusted with the technical management of the project, is no coincidence. Trovicor is de facto, a renamed earlier part of NSN, which was until 2009 part of NSN itself, until it was sold to the investor Perusa Partners Fund 1 LP and called "Trovicor". The connection seems to be quite however that did not undermine the cooperation within the partners. Rather, the sale of the controlling party can be regarded as an image makeover after NSN had come under criticism because of deliveries to Iran. "No we do not sell monitoring center equipments anywhere around the world. This is a business we exited almost two years ago (March 2009). It is best to avoid getting into a discussion of the Business Intelligence Solutions"
NSN, Utimaco and Trovicor are not the only ones who are helping Pakistan in the total surveillance of its population. They also include Alcatel, Atis, Ericsson, Huawei and SS8. For several years, the monitoring capacity of Pakistan has massively expanded. Confidential communication is attempted to suppress, all providers will need to provide monitoring interfaces. Fundamental rights are being eroded, as they do not apply to the work of the police and military. Where judicial arrangements are mandatory, they are awarded even for specious arguments. 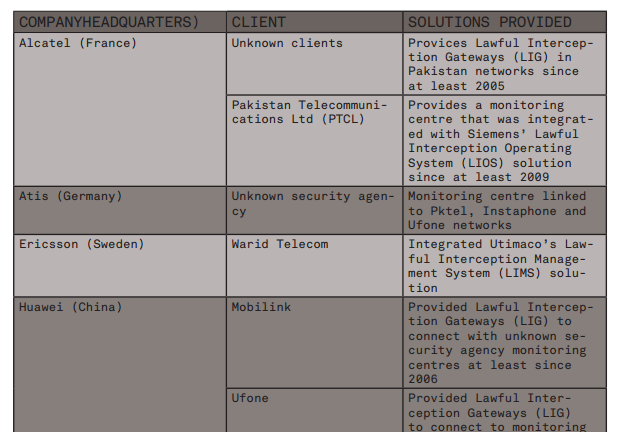 What Privacy International's document states: Pakistan is expanding its capacity, European companies are deployed. And although it is always like emphasizes it provides no surveillance technology to countries with questionable democratic understanding. Faith can be the long gone. Update: NSN reported by providing clarification - They do not to sell Telecommunication Monitoring Center. The integration of lawful interception in communication equipment is, however, required in almost all countries of the world and cannot be refused. Well, we do not deny. The moral obligation not to sell to any customer, especially if it is not obvious that the data for the persecution of people with non-state-compliant opinion are used, we can see anyway. Business interests should not make obsolete a social responsibility.